One of the darlings of Sundance 2013 and a critic’s favorite, The Spectacular Now is about two high school seniors in love. Sutter Keely (Miles Teller) is a functioning alcoholic who’s never without his booze-spiked Thirst Master cup. After a nasty breakup with the popular Cassidy (Brie Larson), Sutter gets to know wallflower Amiee Finecky (Shailene Woodley). Though he feigns casualness, Aimee and Sutter develop a tight, alcohol-fueled bond. These characters deserve equal time, but Aimee is shafted. This is Sutter’s show, to the film’s detriment. Scott Neustadter and Michael H. Weber adapted their screenplay from the novel of the same name by Tim Tharp. Director James Ponsoldt handles the material with great sensitivity and gentle humor. The first half builds Sutter and Aimee’s relationship tentatively. Never involved with a guy before, she doesn’t party (or drink) when she first finds Sutter passed out on a random lawn. He’s always been the life of the party, living in the “now” and generally avoiding responsibility. His alcoholism isn’t dealt with head on, with his mom (Jennifer Jason Leigh), sister (Mary Elizabeth Winstead), and friends turning a blind eye toward his problem. Amiee is actually the more interesting character. She isn’t so much in love with Sutter, who hardly seems her type, as she is with the very notion of being in love. As she attempts to mold herself to fit his style (embracing his ever-so-romantic gift of a flask), she loses something of herself. Her love of manga, for instance, quickly disappears (even after Sutter makes a passing attempt to embrace the medium). It’s a film written and directed by men that doesn’t seem to realize how much it caters to a male audience. As bookworm Aimee makes college plans, trying to involve Sutter (who may not even graduate), Ponsoldt and company take several easy ways out. As it becomes increasingly conventional, The Spectacular Now gradually turns into The Predictable Now. The lead performances just about save it, especially the excellent Shailene Woodley. After turning heads with her deservedly lauded supporting turn as George Clooney’s rebellious daughter in The Descendants, she manages to take Aimee much further than the screenplay ever tries to. She makes Aimee’s somewhat inexplicable infatuation with Sutter entirely believable. As Sutter, Miles Teller (perhaps best known as Willard in 2011’s underrated Footloose remake) achieves the impressive feat of making an outwardly unlikeable character seem endearing. He digs beneath the surface of Sutter’s forced, artificial, “it’s all good” persona to find the soul of a young man raised without a strong father figure. 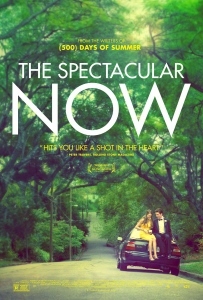 Don’t get me wrong, The Spectacular Now is worth seeking out despite its near-fatal flaw of brushing Aimee to the side. See it for the performances of its two rising young stars.